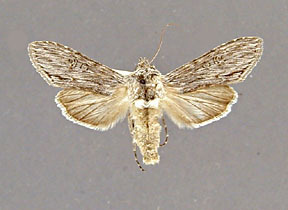 Cucullia eurekae Poole, 1995, Moths of America North of Mexico, 26.1:56, plate 2, figs. 18, 19 adults, plate D, figs 13, 14 male genitalia, plate H, fig 11 female genitalia. Diagnosis: I have segregated a small group of specimens from Eureka, Utah from the extensive series of antipoda collected by Thomas Spalding in the early part of this century. I believe these specimens represent a distinct species. On the other hand this "species" may be only one more manifestation of the variability of antipoda. Four characteristics of these small specimens have led me to propose a specific name. 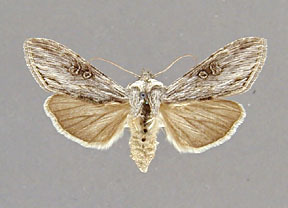 Cucullia eurekae is consistently smaller than antipoda from the same locality. Secondly the overall coloration of eurekae is duller and generally less contrasting than that of antipoda. 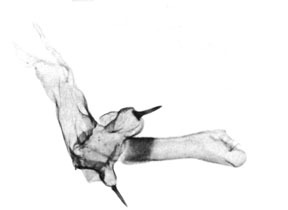 Third, the valve of the male genitalia is narrower, on average, than in antipoda and the corona tends to be reduced, reaching only half way across the apex of the valve. The larger of the spine bearing diverticula in the vesica of eurekae is clearly double (i.e. with a second outpocketing of the diverticula), but clearly single in antipoda. A large bulbous outpocketing exists at the base of the long tail of the vesica in eurekae, but in antipoda there are two or three small outpockets. 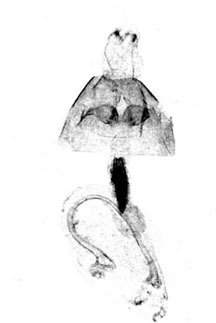 Fourth, the lobes of the sternite covering the ostium of the female genitalia are deeply and distinctly bilobed in eurekae, but slightly invaginated in antipoda. 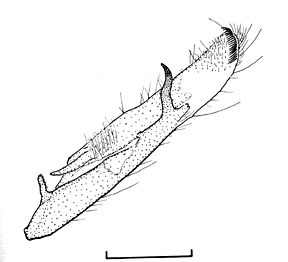 This character of the female genitalia must be used with caution because of the tremendous variability of the genitalia in both of these two species. Finally, there are specimens of this species from Mohave County, Arizona. Cucullia antipoda has not been collected at this locality. Wing length from base to apex: mean = 16.04 mm., standard deviation = 0.85 mm., n = 10. 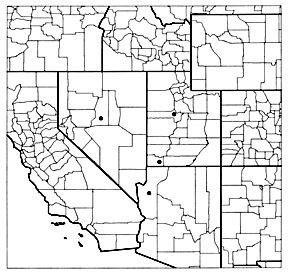 Adults have been collected in May and June in Utah and Nevada, and March in Arizona.